Is this Patricia Tallman in the TNG episode “Half a life”? Sorry for troubling you guys, but I just have to know.. could this be Patricia Tallman in the elevator in ST TNG episode "Half a Life", time index 08:19? That's season 4. Was she already working there then? This is Cameron Oppenheimer playing Tactical Officer Ensign Kellogg. The actress actually 'stood in' for Gates McFadden on several occasions (as did Patricia Tallman due to their similar physique) which I'm assuming is why you're mistaking the two of them. Not the answer you're looking for? Browse other questions tagged star-trek star-trek-tng actor-identification or ask your own question. Why is Counselor Troi in uniform in ST: TNG “Encounter at Farpoint”? 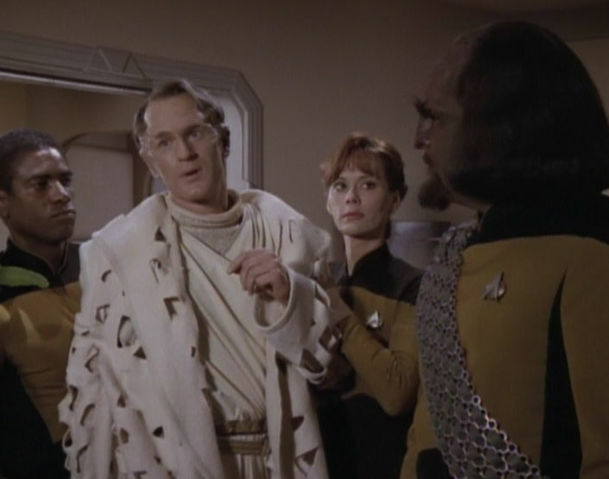 What happened to Commander Shelby after TNG episode Best of Both Worlds part II? To what extent was Scotty missed by his friends and colleagues when he vanished into the 24th Century? Which Star Trek episode featured humanoids who have a one-month life span? What's an ODN line, and what does ODN stand for? Why wasn't Gates McFadden removed from the opening credits of season 2 of TNG?